Mid-summer John Raspanti approached me with an idea for a John Hamilton feature. To date little is known about this thespian so if "The Rascal" was up to the challenge and able to bring new insights to the readers I was all for it. For reference I dug into my archives and sprung open a 1972 Warner Brothers Television Distribution folder. Inside I searched for the John Hamilton biography it contained to assist him with his efforts. I knew someday this folder would come in handy. John was resourceful in utilizing this bio and explored further to find other interesting information. In a recent discussion with Jack Larson, he told me Mr. Hamilton's son could be a tremendous resource if we were lucky to find him. Jack knew only that John's son served in the military. So let's keep this page as a work-in-progress and hope sometime in the future John's son will pay us a visit and we can learn more about the figure so many are intrigued by. John R. Hamilton was born in Shippensburg, Pennsylvania on January 16, 1887. John’s namesake (but with a different middle name) was working as a store clerk when his youngest of four children was born. Sadly, John’s mother Cornelia died eight days after his birth. John grew up in neighboring Southampton, Pennsylvania a town located 18 miles north of Philadelphia. 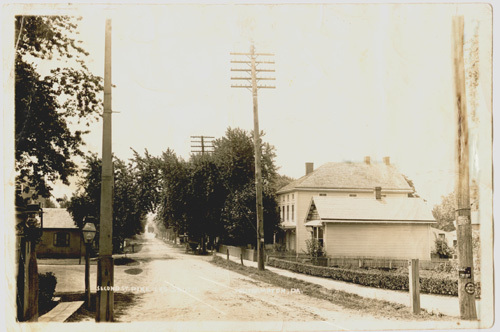 Mainly a farming community, the Hamilton family likely found Southampton’s small town feel very comfortable. 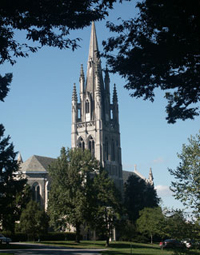 John attended high school at Mercersburg Academy, a co-educational boarding school for grades 9-12. The school's mission was “to prepare young men and woman from diverse backgrounds for college and for life in global”. John seemed to embrace this philosophy. His father had been appointed a trustee to the State Superintendent of Public Education and so it was expected of John to pursue the highest form of education. 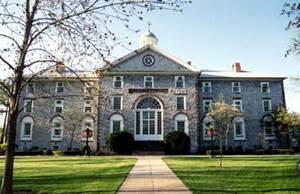 John did well and moved on to Dickenson College, a private residential liberal arts college in Carlise, Pennsylvania. John graduated from Dickenson and then attended Pennsylvania State Teacher’s College. It seemed his future was set. However, at some point something had changed in John. Maybe a traveling theatrical group came to the college or possibly the flickers as they were called intrigued him. Whatever it was he was about to make a drastic change in his career path. He would forgo it all for the stage. It’s not hard to imagine that John’s father was not happy with his decision. Nevertheless, John had made up his mind. He had heard his calling and the stage was beckoning him. So off he ventured to New York where he spent the next 25 years honing his trade in all kinds of productions. He appeared on stage with such icons George M. Cohan, Lew Fields, and Ann Harding in musicals and dramas. He appeared in the production of Lightening’, and had choice roles in productions of Seventh Heaven and Broadway. In 1930 at age 43 John decided to give the movies a try. His first role was as “Grant” in a film entitled Dangerous Nan McGrew, followed by a smaller role in Heads Up. Next he was cast in a series of two- reelers costarring with Donald Meek. The short 20 minute films were adaptations written by Philo Vance creator S.S. Van Dine and were produced by Vitaphone Pictures in New York. In a two-year span thirteen of these shorts were filmed. In 1937 Warner Brothers summoned him to Hollywood. At 50 years old he was working at the legendary Warner Brothers Studio in Burbank. John’s booming voice was in a sense typecasting him to similar roles. 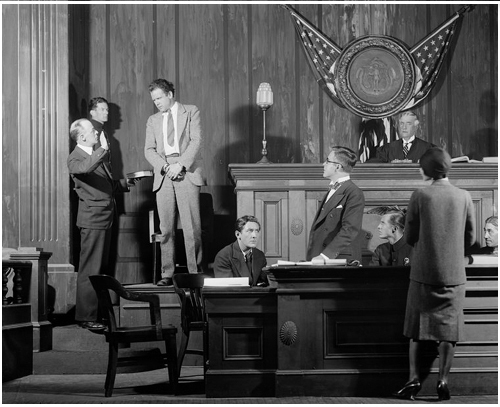 He was very adept at playing judges, department heads, and police chiefs. Rewarding or not, the work was steady and the money during the height the depression was good. John’s mug was seen in a whopping twenty-two films in 1937 followed by twelve in 1938. The following year he was cast in Dust Be My Destiny with John Garfield. 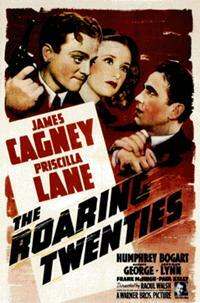 Later in that same year he had a small role in The Roaring Twenties starring James Cagney. In 1941 he shared the screen with three legends, first it was Gary Cooper in Meet John Doe, then Humphrey Bogart in The Maltese Falcon, and last but certainly not least Errol Flynn in They Died with There Boots On. John played a colonel in Boots, a district attorney in Falcon, and a Governor’s assistant in Doe. Universal Studios appearing in The Brute Man with Rondo Hatten. In 1947 he was "Timothy X, Big Tim Donlin” in the News Hounds, a Bowery Boys feature. He was a businessman in The Babe Ruth Story and a prison warden in Sheriff of Wichita. In 1950 he was hired to play a justice of the peace in the Marlon Brando film The Men. By this time John was also a father, his son being born sometime in the late 1930’s. Moving over to television, John continued to work steadily in other features. During the run of the Superman series, John made appearances in The Cisco Kid, The Gene Autry Show, and The Cavalcade of America. You can spot him with The Three Stooges in Listen Judge (guess who’s the judge) looking serious and not at all amused! John was 64 years old when he was cast as Perry White. The consistency of the job probably appealed to him. He was hired on the same day as Robert Shayne. As Superman scholar Michael Hayde recounted, “John's agent would have brought it to his attention, as happened with Bob Shayne and Jack Larson. At that point, John would have done a brief interview with Bob Maxwell and Tommy Carr, then offered the role. That's usually how it went. 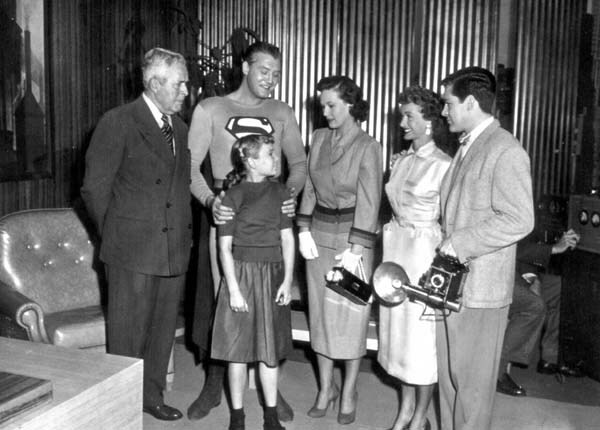 I think if something different had happened - as with George Reeves and Noel Neill (both directly approached by the producers) - somebody would have remembered”. The casting of John as Perry White was perfect. His explosive voice coupled with his blustery delivery created the ideal foil for Jimmy, Lois, and Clark. His two favorite phrases “Don’t call Me Chief” and “Great Caesar’s Ghost” are still remembered fondly fifty years after he first spoke them. His Perry was loud and grumpy (especially with Jimmy) but viewers soon realized that inside the chest of the old curmudgeon beat a deep and caring heart. Jack Larson remembers John with much affection. “It took me quite awhile to be friendly with John. I admired him enormously. He was an actor from the Lambs Club in New York. He had done plays like Lightening and was earning his living in motion pictures. He was a single father raising his son. John liked to be called “Mr. Hamilton”. He was Mr. Hamilton to me before he became John. We had a good thing going when I would say “Thanks Chief” and he would say “Don’t call me Chief”. John spent a lot of time in Perry White’s office. Occasionally he ventured outside and away from the Daily Planet. In "The Evil Three" he’s bonding with Jimmy (and not nearly as scolding) when they stumble upon a strange hotel with some even stranger in inhabitants. He dies in "Mystery in Wax" after castigating the loony Madam Selena Dawn. In "Perry White’s Scoop" he decides to solve the mystery himself after complaining how his reporters rely too much on Superman for help. He ventures to Africa to find his sister in "Drums of Death." 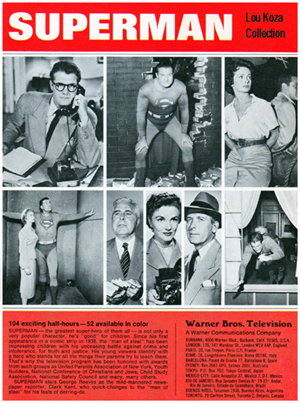 In 1954, John as Perry again left the Daily Planet. Perry feels like he’s losing his mind. The episode entitled "Great Caesar’s Ghost" showcases John’s ability to reveal another more vulnerable side of Perry White. Other notable moments include a trip back to the stone age in "Through the Time Barrier," caught in a diving bell trap in "Superman's Wife," and rope-tied to a saw mill log in "The Perils of Superman." He played White until the series ended in 1957. Health problems had began to crop up. His memory was getting faulty. Director Tommy Carr remedied this. “Take him away from his desk and we were gambling. We could be there all day trying to get the words out”. 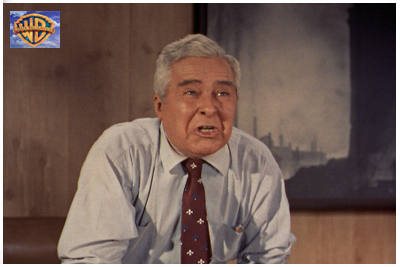 According to Jack Larson, script pages were kept on John's desk. They looked like normal pieces of paper that blended in so no one was the wiser. John’s lapses must have bothered him but he kept on working. He appeared in episodes of Blondie, Chicago Confidential, and Tales of Wells Fargo in late 1957 and '58. 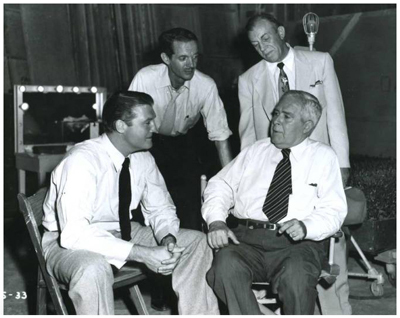 John Hamilton during a break between filming Joey, with Mauritz Hugo, Billy Nelson and George Reeves. 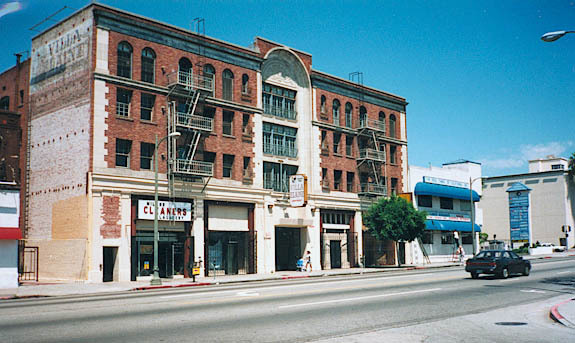 During the run of the Superman series, John was living in an apartment on Vine Street in Hollywood. In 1958 he moved to Glendale with his son. In October of that year, John suffered a heart attack and died. He was 71 years old. The Superman cast would reunite one more time. 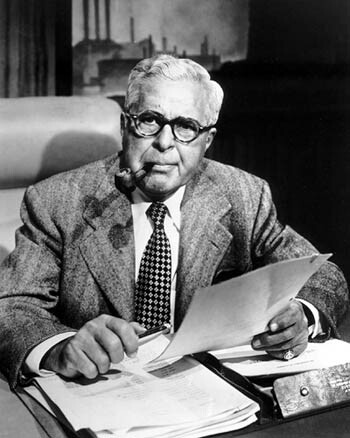 In some respects, John Hamilton has achieved the same kind of immortality as George Reeves. He played a bigger then life character and made him totally his own. Whenever there’s a discussion on who was the best Perry White, John usually comes out on top. He layered his Perry with depth and dignity and even made him lovable. There is no doubt that part of the reason that the Adventures of Superman is so popular is the dignified presence of John Hamilton. So rest easy Mr. Hamilton senior. Your boy did very well. Hey, John: Just want to say that I really enjoyed your article on John. It was very informative, and extremely cool to see pictures of his boyhood town and the schools he attended. You really captured a picture of his youth. It's difficult to go that far back in time and accurately recreate someone's life, but you did a very good job. About the only thing missing was his full middle name: Rummel. 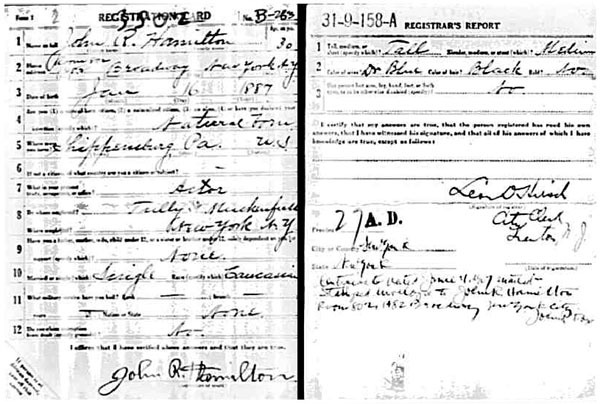 Since I'm a member of Ancestry.com, I have obtained a copy of John's World War I Draft Registration card, from 1917. Thanks for this well-written and crucial piece about a key TAOS member. To our readers. I think it can be said that to date not much has been told in great detail about John Hamilton and thanks to John "The Rascal" Raspanti we can appreciate Mr. Hamilton just a little bit more than we've come to know. I hope you enjoyed this segment and we thank you for tuning in. I like to think we will, over time, be able to add more information if we are fortunate enough to see anything come our way. In the Shadows of "Panic in the Sky"